According to the plan, one lane of the main road will remain completely functional towards Pune. While the Pune Metro work is going in full swing, some hindrances have caused the city-dwellers to face traffic-related problems. So, to avoid this congestion, Pune Metro has released a traffic diversion plan for that area prepared by College of Engineering, Pune (COEP) and approved by traffic authorities. The work has already commenced from Pimpri to Dapodi and in Vanaz & Kothrud. We have carefully designed a specific traffic diversion plan to help citizens commute with ease. With support and cooperation during such situations from the residents of the area, we will complete the project in time,” said Dr Brijesh Dixit, managing director, Maha Metro. Talking about the work plan, Maha Metro has pointed out that a less clear traffic plan can be seen on the Nashik Phata to Kharalwadi foot-over-bridge. The vehicles moving on the main lane stands diverted to the service lane and traffic flow on the service road will be as usual. 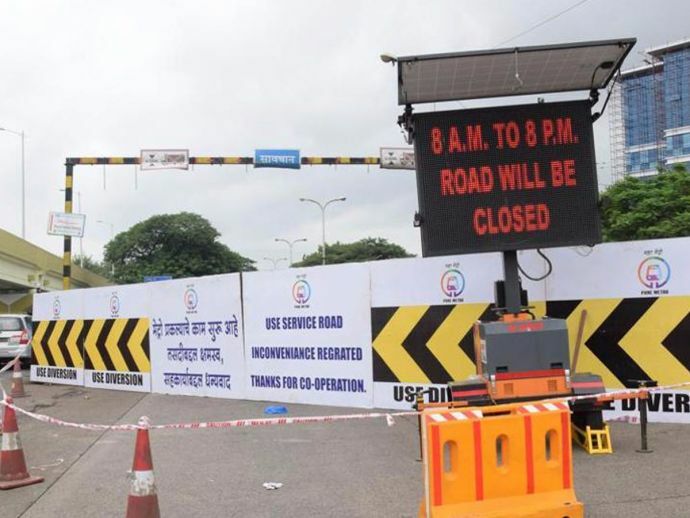 Both lanes going towards Mumbai on the main road will be closed between 11 am to 5 pm during the day and 11 pm to 5 am during night and rest of the time one lane will be available.